Happy birthday Jon Agee (Terrific; Palindromania! ), Javaka Steptoe (In Daddy’s Arms I am Tall:African Americans Celebrating Fathers , Hot Day on Abbot Avenue), and Melissa Sweet (River of Words, Tupelo Rides the Rails). It’s the birth date of Jean Lee Latham (1902-1995), Carry On, Mr. Bowditch. It’s National Garlic Day. Read Onions and Garlic by Eric A. Kimmel, illustrated by Katya Arnold; Vampire Boy’s Goodnight by Lisa Brown; Vampire State Building by Elizabeth Levy, illustrated by Sally Wern Comport; and A Vampire is Coming to Dinner: 10 Rules to Follow by Pamela Jane, illustrated by Pedro Rodriguez. Organizers of National Gardening Month suggest sharing plants with friends and planning a community clean-up. 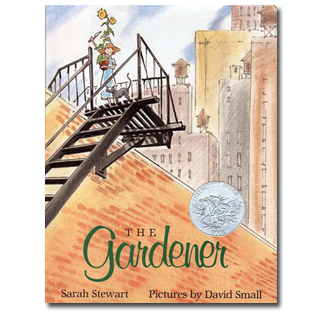 Before you get started, you might want to pick up a book that will inspire you, Sarah Stewart’s The Gardener, with illustrations by David Small. Certainly one of the most satisfying picture books of the last fifteen years, the text of this Caldecott Honor Book is presented in letters from a young girl Lydia Grace Finch circa 1935. Readers first see Lydia on the endpapers, picking tomatoes with her grandmother in a lush country garden. Lydia has been summoned to city to live with her uncle Jim, until things get better for her family hit hard by the Depression. Lydia leaves King Mill on a train, carrying packets of seeds from her grandmother. When she arrives in the city, the dark, unlovely railroad station looms over her. An optimist, Lydia notices window boxes and beams of light. Although her uncle Jim does not smile, she writes him poetry and learns to work in his bakeshop, kneading bread. But Lydia is a gardener at heart, not a baker. In this impoverished environment, she finds a secret place to ply her craft: the apartment building roof. Vacant lots provide the necessary dirt; cracked teacups and bent cake pans become the vessels for her dreams. 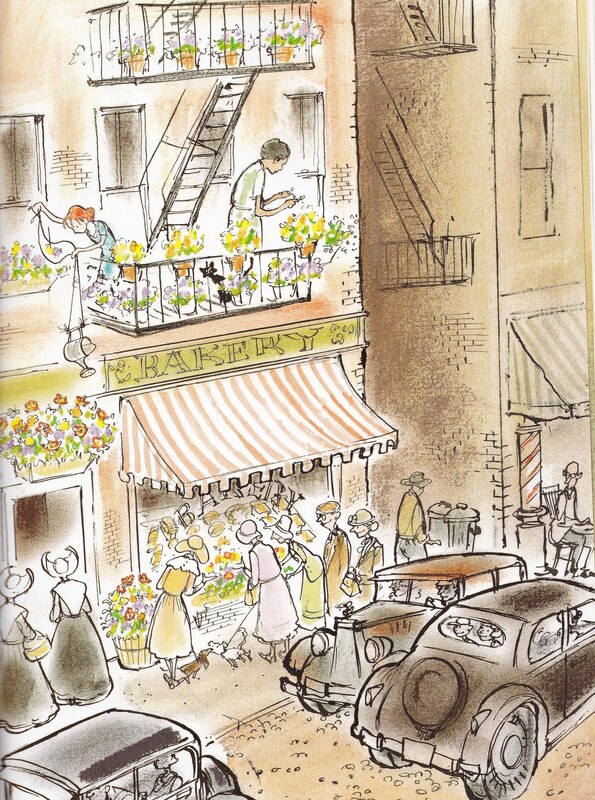 Lydia also spruces up her uncle’s bakery, planting tulips, radishes, onions, and lettuce in the window boxes that adorn the shop. Finally, she shows her rooftop garden to grumpy Uncle Jim, a once-grimy place now transformed into a beautiful patio garden. After Lydia’s father finds a job, this no-longer unhappy man hugs his niece as he sends her back to her home and the garden and people she longs for. A totally satisfying story in itself, The Gardener is brilliantly illustrated. In watercolors with a strong black line, David Small set scenes and shows what characters feel, even when those emotions are not described in the text. The transformation of useless city space to a splendid garden satisfies readers every time as they watch it happen. When this book appeared in 1997, I thought it a wonderful re-creation of the Depression Era for children. Now it seems to me an even more important book. With children who might well identify with a parent out of work or having little money, the book speaks to the true American can-do spirit. Make beauty where none exists; plant victory gardens; transform useless landscapes into those that produce food and joy; reuse and recycle. The Gardener can be used to talk about all of these contemporary issues. It continues to send its readers off to find that “bit of earth,” whether in vacant lots, window boxes, or well-laid-out garden beds. Originally posted April 19, 2011. Updated for . Thank you for posting this! I really really love this book! This book is full of beauty, full of hope, and full of love. It touches my heart always and makes me both smile and cry. I start off the school year every year with their book The Library!! I can’t believe, in the world of books, you chose to feature The Gardener today. I just gave it to my granddaughter this weekend for her birthday. Even though her mother tells me she has outgrown picture books – in first grade! – I bought it anyway. When I think of one important message I could impart to her, as her grandmother, it’s the one so subtly illustrated in this book: How one young lady can bring beauty into the world and change lives. Richard Rhodes once told me that adults with a brutality history in childhood, are driven to nature as adults, for recovery. I think that goes for gardens as well. The funny thing for me is, flowers and tress explode out of the ground if I just think about them, but vegetables don’t know me. I guess they know how much I love to eat them. Everyone should have a Secret Garden. G. Perry…I LOVE your comment. I agree about the Secret Garden. When I first read David Small’s “Stitches” right after it was published, the only thing I could think to do was to reread “The Gardener”, and then read it again. It was like some sort of hopeful, spring-llike, antidote to having finished his intense and painful memoir. That he could illustrate both books so perfectly, leaving me with such a different feeling at the end of each, is testament to his ability to communicate powerfully through his drawings. What a gem, what a gem! Love what you said about it. Love what everyone says about it. Love what it looks like. It’s half past one in the morning where I am currently (travelling). I just have enough time to add this book to my wish list for the next order. Thanks for this great comment — and I hope you get some sleep. Sorry to “break the bank” — but it is for a great cause. Jory: I too reread The Gardener after finishing Stitches and both were completely satisfying, heartbreaking, and joyful in totally opposite ways. Both tell stories about finding happiness and hope in unexpected places, albeit in very different ways. Together, these explain why David Smalls is one of my favorite illustrators. 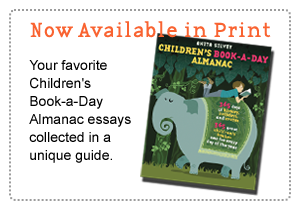 This is a favorite of my kids, too – and no way is 1st grade too old to enjoy a picturebook!!! Thanks for sharing one that is on my top-ten list! David Small’s illustrations are always gorgeous. I first discovered him through Elise Broach’s “When Dinosaurs Came With Everything,” and as I meander through the world of children’s literature, I become more and more delighted to find more books by David Small. Love, Love, Love the illustrations in this book. David Small’s use of color and light really add to the story behind Stewart’s text. I read this book in the dead of winter and it only made me yearn for spring much more than I already was. It brought me back to my own family garden and planting with my father. A gorgeous story, full of strength and heart. One of my all time favorite picture books! My daughter, youngest son and I loved reading this book together in the spring as we were trying to decide which new plants to choose for our ever changing perennial garden. I keep hoping that Sarah Stewart and David Small will pair up as author and illustrator on another picture book. Their four picture books have made us laugh and cry. “The Library” and “The Friend” hold special places on our bookshelves. 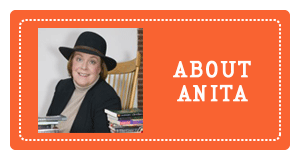 Anita, I was thrilled to discover in my morning paper that you will be speaking at The Richmond Public Library on May 19th. Can’t wait! Diane: I am really looking forward to being in Richmond. They have used Everything I Need to Know I Learned from a Children’s Book as an all-community reads. Although I had heard about this book, I did not actually read it until recently. I love that Lydia is able to find a space to plant flowers even in the middle of a big city. As someone who always likes to have plants around, even if it’s just a little potted plant in a dorm room, I completely understand her desire to have flowers. I also love her persistence in convincing her uncle to smile. This is definitely one of my new favorite books! I love David Small’s illustrations and recently read Imogene’s Antlers and One Cool Friend for a project. I will definitely be putting this on hold at the library and am especially looking forward to seeing the endpapers. I have a newfound appreciation for well-designed endpapers!